Falkirk will go into this weekend’s opening SPFL Championship fixture against Hibs with no surprises in the squad list. The team will show no new additions between now and Kevin Clancy’s opening whistle, despite fevered fans speculation. Rumours of a midweek loan signing had no substance and Peter Houston says he is done in dealings until January – unless someone signs one of his players and he’s forced to find a replacement. “We’re finished now, and we’ll look at it again in January,” said Houston. “We’ll start the season with the team we have, unless someone goes out which is highly unlikely. Fans though are keen for one more signing, and Houston acknowledges the expectation levels from the stands are high – and right across the division. He added: “They always are, at every club. Hibs fans will expect the Cup again. 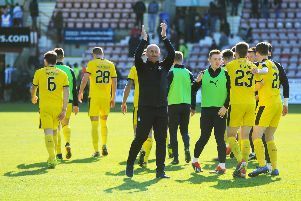 Falkirk fans - I think - will be wanting the playoffs again, some will think we’ll go and win it - it will be difficult but that’s not to say we can’t. “If we improve on last year, we move divisions. We fell short, the aim is to improve on it. “We lost four games, less than anyone in the division. Anyone who only loses four this season will win the league.